Reformed APC members vow to leave ruling party despite negotiation – Royal Times of Nigeria. A leader of the Reformed All Progressives Congress (R-APC), Alhaji Kawu Baraje, and the spokesman of the APC bloc, Kassim Afegbua, have said there is no going back on the decision to leave the APC. Baraje who spoke in Ilorin, the Kwara state capital, said the overtures from President Muhammadu Buhari and the APC National Chairman, Adams Oshiomhole, to their political leader, Bukola Saraki and others was belated. Baraje, a loyalist of the Senate President said nothing can compensate their members for the embarrassment and horrifying experiences many including Dr Saraki have suffered in the hands of some few mischievous members of the APC. The former nPDP chairman also added that the group has resolved to leave the APC, even if Senate President Bukola Saraki decides to stay back in the ruling party. Speaking in the same vein, Afegbua, in a brief statement said it is quite unfortunate that President Muhammadu Buhari had to wait till the eleventh hour before opening doors for reconciliation. 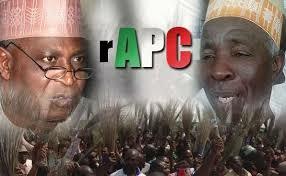 He also rebuked the party leaders for extending hands of fellowship to Saraki after his victory at the Supreme Court.